After a photo of a health store worker posing stone-faced next to an uncharacteristically ebullient Rahm Emanuel went viral on Wednesday, the man in the photo told In These Times that the Chicago mayor only cares about the city's poor and working-class residents when there's an election on -- and that he's an atrociously bad tipper, to boot. The man in the photo, whom In These Times identified as "GQ," posted the photo to Instagram with the caption, “The Mayor of Chicago Rahm Emanuel came by my job, still can't stand this muthafucka tho." While GQ added the photo two months ago, it took off on social media Wednesday, less than two weeks before the mayor's runoff election against Jesus "Chuy" Garcia. 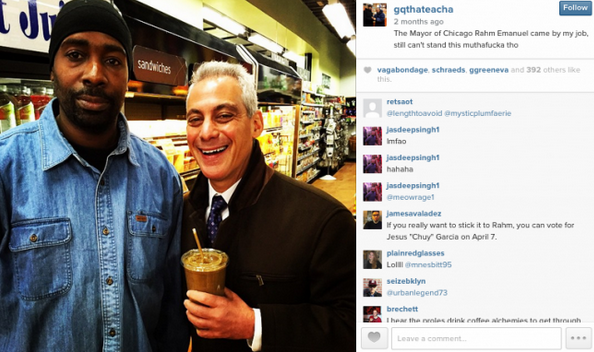 GQ told In These Times' Micah Uetricht that he was on the job at a health food store on Chicago's South Side when the mayor stopped by and asked for a photo. He added that the mayor -- whose neoliberal policies earned him the moniker "Mayor 1%" -- is really only concerned about the city's most affluent residents. Meanwhile, GQ said, the mayor has done too little to address -- and in many cases has brought about -- the woes confronting the rest of Chicagoans. GQ found himself just as unimpressed with the mayor's tipping. “He’s real cheap," he said. “My friend who made the drink [held by Emanuel in the photo] only tipped him like a quarter or 50 cents." The drink cost $7, GQ said. While he's no fan of Rahmbo, GQ identified one politician who does have his support. “The only politician I’ve got mad respect for is Elizabeth Warren," he said. "I love her."